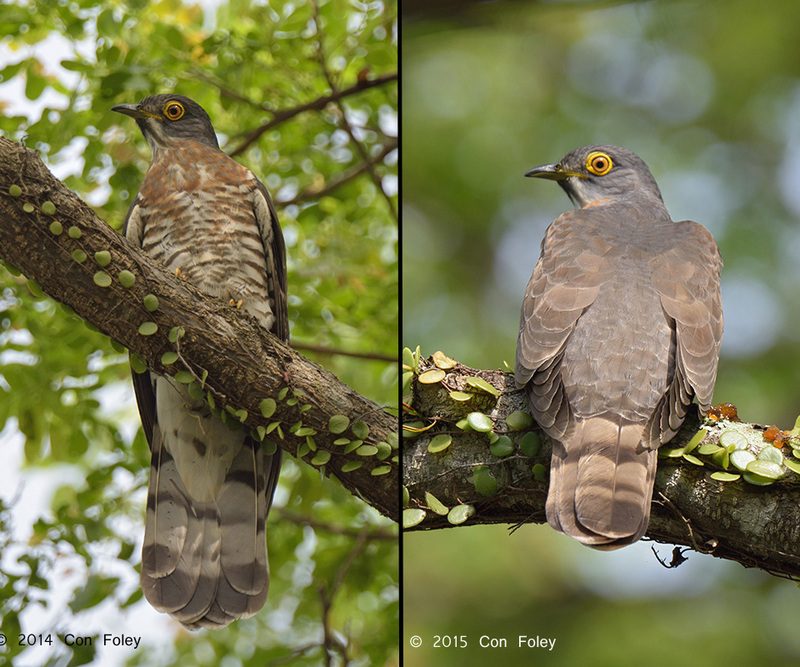 Here in Singapore we have had a bumper year in 2015 for migratory Large Hawk Cuckoos, with several sightings in several different plumages. Here are three sets of front and back views so we can get a good look at the differences. The first clue of course is size. The Large Hawk Cuckoo is the largest of the hawk cuckoos at 38-40 cm in length. The Malaysian and Hodgson’s are both 28-30 cm. So on average the Large Hawk Cuckoo is 10 cm longer. This might be recognized in the field. First starting off with the adult plumage, this is fairly easy to identify, as it looks like no other hawk cuckoo that is present in Singapore. 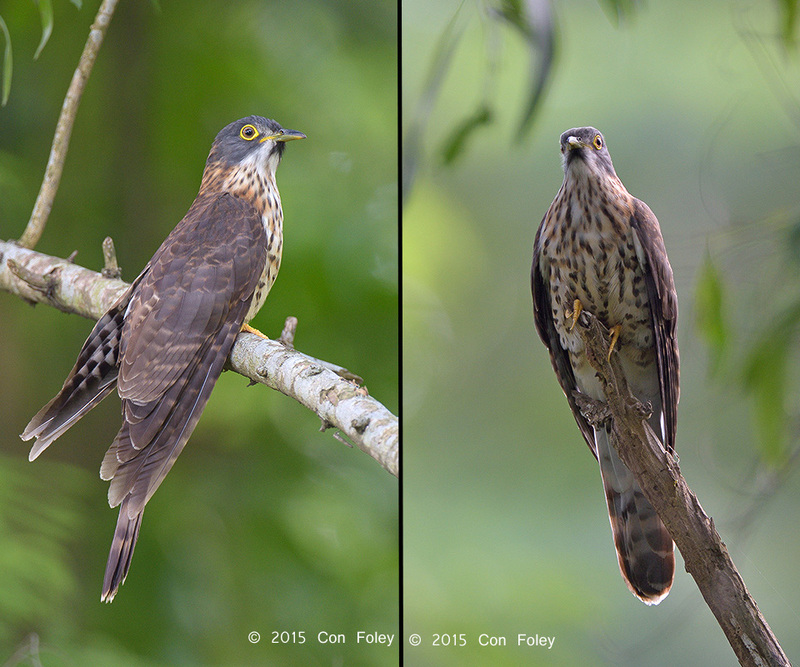 These photos were taken on 12 Mar 2015 in Pasir Ris Park. This particular bird appears to have been a one day bird, in a hurry to make its way home. Sorry for the wrong date on the left hand photo, but taken on the date in 2015. Thanks to Lim Kim Keang for the tip on the presence of this bird. The front view is the most diagnostic, the upper breast having a rufous wash, and the belly horizontal baring. In particular the horizontal baring is not present on any other hawk cuckoo that we get. The head is dark grey, almost black, and has a prominent black chin. The back view is notable for its absence of whitish tertials and a white patch on the nape, which is often present but variable on the other hawk cuckoos. Note too the penultimate tail band is narrow reminiscent of Hodgson’s Hawk Cuckoo. Then we have the sub adult plumage. These photos were taken on 4 Jan 2015 in the former Bidadari Cemetery. This particular bird was a long stayer, arriving sometime in December and still around into February, clearly over wintering. This bird became quite people-friendly and many folks got photos. Again the upper breast has a rufous wash, but not as completely filled in as the adult plumage. The upper breast and belly is marked with bold streaks. This plumage might almost be mistaken for a sub-adult Hodgson’s Hawk Cuckoo, except the streaking is much bolder here, and the back view has the absence of whitish tertial and white patch on the nape. Again the chin is very dark, but some Hodgson’s can also have rather dark chins. However, there is one other key diagnostic that I’ll come to in a moment. And then we have a plumage I wasn’t really familiar with until this year. This is the juvenile plumage. These photos were taken on 23 March 2015 in the former Bidadari Cemetery. This particular bird was likely first spotted several days before I took these photos. As of the date of this post 28 March 2015 I don’t know if it’s still around, but likely on its way home. On first viewing especially the front view looks remarkably like a Malaysian Hawk Cuckoo. There is no rufous wash. Just dark brown streaking on the chest and belly. It does have a very dark chin, and I’d say the streaking looks bolder, but this won’t be so easy to spot casually in the field. Looking at the back view there is no indication of whitish tertials nor any whitish patch on the nape, although you could say the nape has some whitish streaking. The penultimate tail band is a bit narrower than you might expect a Malaysian Hawk Cuckoo’s to be, as they are rather uniform in width. But again these are perhaps subtle differences not so easily noticeable in the field. What’s the big difference then? Have a look at the bill color for all three birds. Black huh? Both upper and lower mandible black, right? 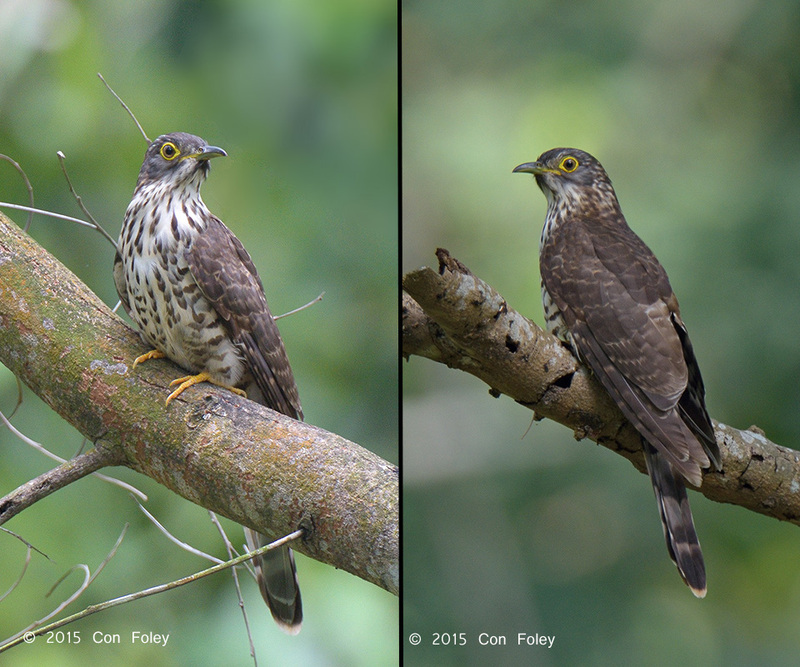 Now take a look at the bill in the Hodgson’s and Malaysian Hawk Cuckoo’s at this link: A Photo Guide to the ID of Malaysian & Hodgson’s Hawk-Cuckoos. I think you can see that for both species, all ages, either the upper or lower or both mandibles have some yellow, with the younger birds having more. Bill coloration seems to borne out by the plates and text in the literature cited. Bill color although it may be hard to notice in the field, should be able to be seen in a photo and thus could be a big help in ID. Now it may be that a few birds will show a bit of yellow on the lower mandible near the tip. But this is quite different from the Malaysian and Hodgson’s who show yellow near the bill base. It was very interesting for me to see all three plumages in this spring migration, what luck! I’m no expert but this is a large bird so I guess it may take more than one year to reach adult plumage. So our juvenile bird could be a first hatching year bird, while the sub-adult is a second year bird. Tail length or overall size of the bird is difficult to judge in a flat two-dimensional photo, as generally there is no reference point. However size is something that can, I think, be judged in the field by an experienced observer having seen many other hawk cuckoos, especially in the former Bidadari Cemetery which is so familiar that even many of the trees are well-known. Flight is another key diagnostic that can be judged in the field, but of courses not in a photo. From experience the Large Hawk Cuckoo flies with much more vigorous wing beats and generally flies much further than the other two species. Hope these tips add to your fun with Hawk Cuckoos ! This post is the result of conversations with Danny Lau, Lau Jia Sheng and Tan Kok Hui. (2) Wells, D.R. (1999). The birds of the Thai-Malay Peninsula, 1. London: Academic Press. (3) Robson, C. (2011). A Field Guide to the Birds of South East Asia. London: New Holland Publishers. (4) Erritzoe, J. et al (2012). Cuckoos of the World. London: Christopher Helm. Hi Morning, ken from Malaysia. I just new on birds photography. Recently try to looking for cuckoo, accept call and any idea for looking this bird. Got season? Or what kind of place easy to spot. TQ very much. The Large Hawk Cuckoo is migratory. So try October through March. It’s not common, but on migration it can show up anywhere, even public parks. You need a lot of eyes out looking! Enlist a lot of your friends to go out looking! Thanks for the ID tips and the excellent photos!